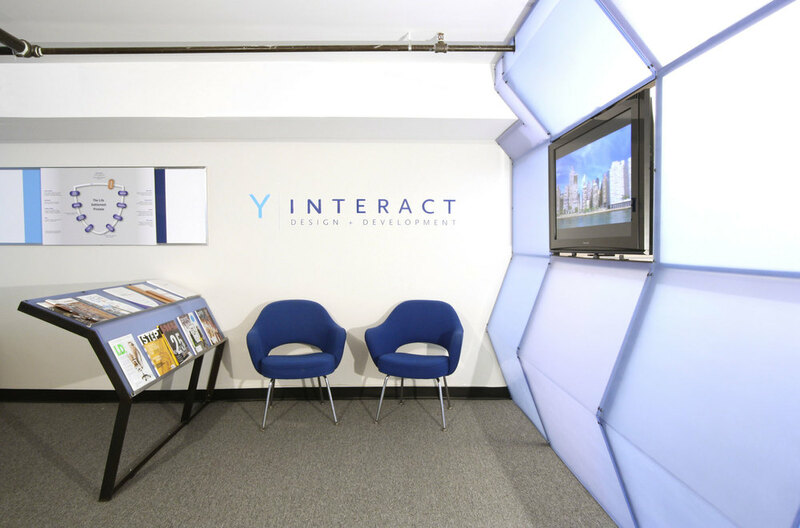 Y INTERACT is an integrated media studio with creative expertise in web, interactive, and print media design. The 1000 square foot office space is located on Canal Street in New York’s Chinatown. The challenge was to develop an architecture and furniture scheme that reinforces Y INTERACTS’s brand identity. Freecell delineated different zones: work area, waiting area, and meeting space. In the main space, we used color and simple forms to strengthen the graphic identity. We designed and fabricated translucent-blue walls to divide the work area from the meeting area. This faceted thermo-formed wall houses a plasma screen that rotates 180-degrees to display past projects in the waiting area or client ideas in the meeting room. The meeting area needed a new table that we chose to fabricate ourselves. The surface is a stretched white nitrile rubber that is supported by a blackened-steel triangulated base. One of its custom features is the integration of outlets on the tabletop so clients can always plug in their laptops. Wrapping the work space is an 18-inch linear datum of white and blue stripes, capped top and bottom with aluminum angles providing a place for displaying work.